About a year and a half ago a museum in Cornwall, United Kingdom approached the Canadian Canoe Museum and mentioned that a family was looking for a suitable location for an ancient relic. A six meter long birchbark canoe had originally headed to England in a ship and sat in a barn slowly disintegrating. Yesterday a public unveiling of the canoe took place along with an Anishinaabe traditional smudging ceremony. 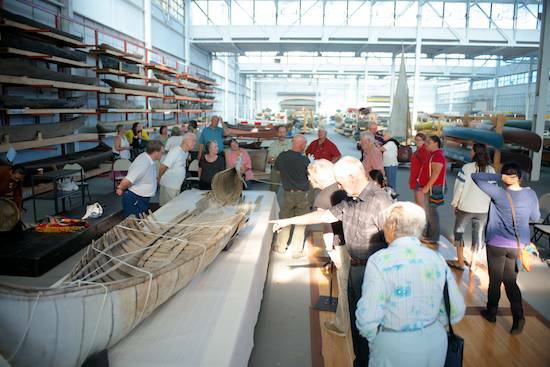 The Canadian Canoe Museum hopes to learn more about the history of this canoe such as who made it and more details about the design, as not a lot is known about birchbark canoes from the 1700's. It is believed it was crafted somewhere along the St. Lawrence River and either purchased by Lt. John Enys or his regiment during or after the American War of Independence. Although Enys had a very detailed journal and an eye for ships (he was also the regiment's historian), the canoe was never mentioned, and found many years later in a barn on his estate. Birchbark canoes do not stand the test of time as well as Dug-out canoes, but the construction does fit its age. It was originally constructed with Spruce roots and wooden pegs, and as time progressed, wrought iron nails were added to keep it intact. At some point canvas has been stitched into place on either end of the canoe and painted to look like birchbark (as indicated by museum curator Jeremy Ward in the above photo) including painting the actual birchbark to try and blend it in. "This canoe is full of stories, and that is going to be exciting for us to follow, to learn and to share". The canoe will not be refurbished, but rather kept for other researchers to study. It will give a peek inside such a relic to see the inner workings of the boat such as the basswood bark used to lash the ends together and the tapered dowels for gunwales possibly made from Spruce.